Don't worry if some of the calls don't come right away. You'll have plenty of time to learn them. The calls taught the preceding week are normally reviewed at the start of the next class. Plan to arrive a little early to the class so you are relaxed for this important first tip. If you are having trouble with a call, don't hesitate to ask one of the club members for a little help during the break; that's why we call them angels! Don't worry if you make a mistake. 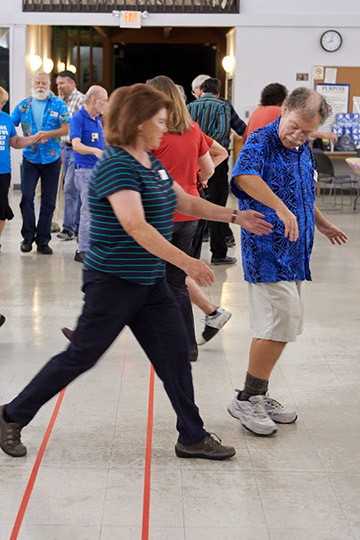 We all make mistakes, even Stewart Kramer, our resident Square Dance Guru. If a club member seems to be doing a call differently from the way you were taught, ignore them! Sometimes we old dancers are so used to doing frills during calls that we forget and do them with class members. You'll have plenty of time to learn the frills and stylings. For now, just concentrate on learning the calls. Don't push! If a class member is unsure of a call, there is a great temptation to try and help by pushing someone into position. Don't do this. Really. Don't push! Yes, I know it can be hard to resist, but it's rude, the class members won't really learn anything that way, and the instructor will have a harder time seeing who's having trouble with what. Do your best to be in the right position yourself, hold out your hand expectantly, or exert gentle hand pressure to get people moving in the correct direction. It is better to let your square break down than to start shoving people around to fix it. Don't play caller. Sure, you can whisper small hints to people who are momentarily confused, but while a tip is in progress, don't try to do any major teaching or fixing on your own. If people are listening to you, they aren't listening to the caller. No frills. Never initiate a frill with a class member. In fact, don't even do them with club members during class tips. Frills make dancing more fun, but they interfere with learning, even if a class member is not directly involved with the frill. For example, it's much easier for class members to understand Square Through without club members turning the wrong way and trying to hold hands all the way through. Once a call is firmly in place, then you can start doing frills with other club members. If your square breaks down during a patter call, go home. Then have the head couples move over to the right next to the sides to form lines facing side walls, and wait for the caller to get everyone else in lines, then you can join in. Listen for the words "Standard Lines Dance Up To The Middle And Back". You might not end up with your partner at the end, but you get to keep dancing. And that's why we're here. When the sequence ends, you can then fix up your square. If your square breaks down in a singing call, those dancing the man's part should go home, and those dancing the woman's part should go find a man to stand with. If you think you know which man you're supposed to end up with, go to him, otherwise just go to someone. That way you'll be able to join back in for the next figure. Try to avoid the grip of death. A gentle handhold is all that's required. Don't hold onto someone's hand if they're trying to get away, even if you're sure that they're not supposed to. You can hurt someone by holding on too hard. Don't drink alcohol or use other recreational substances before coming to dance. It's not fair to the other seven people if you're not at your best.